Self-publishing seemed like the best option to allow me to keep writing long term, maintain full creative freedom, and work at my own pace. Previously I had sold a short story to a print journal in the USA, but I have never submitted my novels to traditional agents or publishers. It's a learning process! The sequel, "An Accidental Messiah," will be released October 24th, 2017, so I'd love to have an Underground review for "An Unexpected Afterlife" around that time if possible. Originally submitted on: August 24, 2017. How does one pick up the pieces of a life interrupted, especially after several years have passed? Things change while one is away, life goes on and the world changes even when you’re gone. Moshe Karlin, successful businessman, husband and father, finds himself in such a situation… well, sort of. You see, Moshe has been dead. Moshe wakes up naked in a Jerusalem graveyard with no memory of dying or an afterlife. He only remembers the life he left behind right up to the moment before his death. Now he finds himself trying to piece together his old life, and trying to make sense of his second life. Moshe is one of a handful of resurrected in modern Israel in what just might be the prophesied End of Days foretold in the Talmud. Frankly, however, the end of the world isn’t what it was cracked up to be. Elijah the Prophet has missed his cue, the Russian Mob is muscling in on the resurrection business, and some of the newly resurrected aren’t following the script. What’s a guy without a belly button to do? For Moshe, its simple – try to patch things up with his ex-wife, find a job and get on with life. I enjoyed the novel’s primary protagonist, Moshe, but in my opinion two other characters stole the show. By far my favorite character was Rabbi Yosef, the humble man of God who takes Moshe in and helps him, and other resurrected, find their way. Yosef must struggle with the calamitous changes the resurrected bring into his life. He is just trying to raise a family, be a good husband, and follow the word of God as best he can, but the foundations of his life and faith are crumbling all around him. Rabbi Yosef must choose between what his faith and strict religious law teaches him is the proper thing to do, and what his heart tells him is the right thing to do. Of all the characters in Sofer’s story, Rabbi Yosef has the most to lose. The other character that intrigued me was Jerusalem itself. Sofer does a stellar job bringing not only the geography of the city to life, but also the contemporary, cosmopolitan atmosphere as well. I’ve never been there, but now I want to go. Oh, before I forget, a quick shout-out to the author for his nod to the 1980’s movie “Highlander” – well played. The overarching theme of AN UNEXPECTED AFTERLIFE seems to be that, even in the presence of extraordinary events, life goes on. People seek the familiar and the mundane, love and relationships, even as events become unimaginably bizarre. Humans take comfort in the familiar, and the most familiar thing of all is love (and maybe really good catered food) – even if you’re a recently dead businessman, an ancient prophet waylaid on the way to Armageddon, or a rabbi trying to keep his wife happy. Dan Sofer’s AN UNEXPECTED AFTERLIFE is one of those unique indie novels that has what I call the “Triple Crown” of literary shelf-appeal. The cover gives the novel a polished, professionally produced image. The tightly-written back-cover pitch grabbed me instantly with an intriguing premise. Finally, the opening set a hook that kept the pages turning. As I delved deeper, I discovered a well-written and engaging novel with excellent character development, fantastic dialogue and an original, well-paced plot. 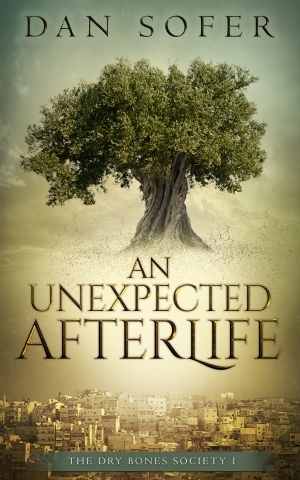 AN UNEXPECTED AFTERLIFE by Dan Sofer earns Underground Book Reviews highest rating – TOP PICK. When he wakes up naked and alone in the Mount of Olives Cemetery, Moshe Karlin doesn’t remember dying two years ago, nor does he realize how hard he’ll have to work to win back his perfect old life… and his wife. In fact, he’ll be lucky to survive his first week on the streets of Jerusalem. Meanwhile, other changes are afoot in the Holy Land. A reluctant prophet prepares to deliver a message of redemption–and the end of life as we know it–when a freak accident changes the course of history. An Unexpected Afterlife is the first novel in the “highly original” new fantasy adventure series, The Dry Bones Society. If you enjoy romance and adventure, humor and heartbreak, engaging characters and non-stop surprises, then you’ll love this romp in legends of the Resurrection and the World to Come. YOU ONLY LIVE TWICE? When he wakes up naked and alone in the Mount of Olives Cemetery, Moshe Karlin doesn’t remember dying two years ago, nor does he realize how hard he’ll have to work to win back his perfect old life… and his wife. YOU ONLY LIVE TWICE? "A masterful storyteller!"